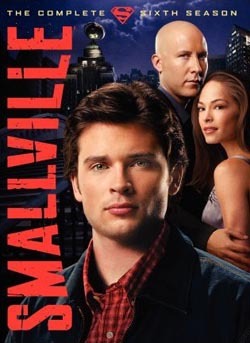 Picking up where its fifth season left off, Smallville's sixth season begins with Metropolis in ruins, Clark (Tom Welling) trapped in the Phantom Zone, and General Zod inhabiting the body of Lex (Michael Rosenbaum). Even when that situation, dubbed "Black Thursday," is over, Clark still has to capture the criminals who escaped from the Phantom Zone. Meanwhile, having driven away Lana (Kristin Kreuk), she finds comfort in the home and arms of Lex, driving further anxiety into that romantic triangle that has expanded to include Chloe (Allison Mack, still with a smile that lights up the orb on top of the Daily Planet) and her new beau, photographer Jimmy Olsen (Aaron Ashmore). And Lois (Erica Durance)? We see hints of her inevitable future in her becoming a reporter for the tabloid rag The Inquisitor ("The thrill of discovery, the clack of the keys, the scent of fresh ink� I think I've finally found my calling!") and flashing some sparks with Clark especially in a Valentine's Day episode called "Crimson."